The Fortress S02 Alarm System is perfect for people looking for a simple, no-frills protection system that they can install themselves in a home or small office. Despite the cost-effective nature of the system you can connect up to 99 different sensors, separated into up to 32 zones that can be activated or deactivated to suit your lifestyle. When an event is detected the unit will call up to six phone numbers to alert you and other family members or colleagues. 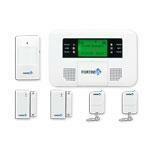 If you need to protect an area where there's no landline, the Fortress GSM Security System is the one for you. Using a SIM card to text or phone you over the mobile network instead of a landline, it offers the same connectivity and detection options around the building that is being protected. Add detectors for water and smoke as well as intrusion detection for complete protection, and use one or more ear-splitting sirens to scare intruders away. The cost-effective Fortress stand-alone systems - Safeguard and Guardian - allow you to protect separate remote areas like garages, sheds and summerhouses. 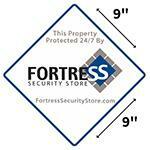 They are portable and use sirens to alert you and scare intruders off. 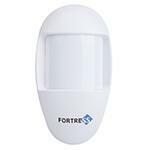 The Guardian is a motion detector with a built-in siren which can be used on its own but it can also connect to up to 20 other accessories (sold separately). 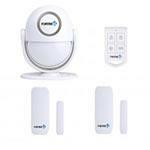 The Safeguard is similar, with a magnetic contact sensor rather than a motion detector.